This bus lane was put in as part of bus priority measures for route 38. Cyclists have waited since 2006 to use it legally. For sending to the leader of each party at Camden Council, but should include points that will be used in the ward level campaigning. 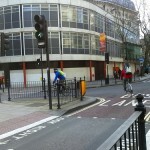 On Thursday 5th September, the new cycle tracks in Royal College Street were officially opened. On 18th August 2013, George led a group of fourteen riders on a 32-mile loop starting and finishing at Sevenoaks.